Please stop emailing me about your sales. And sending me enticing promotional postcards. I can’t take it. I wish your clothes weren’t so ridiculously cute. My girls are now outfitted until they go to college. P.S. I didn’t really mean what I said about wishing your clothes weren’t cute. P.P.S. Feel free to send me some free stuff. Those Gymboree ads are an addiction over here, too! And what's really scary is that I check in on the website in between ads to see what's on sale! I think I may have a problem…. And did you know that on Black Friday everything is 30% off, and if you have the coupon they mailed out, or one from Cookie magazine, you can ALSO use it for an EXTRA 20% off???? But then, is it worth waiting for Friday when you can get 25% plus 20% off right now???? No, I don't work for Gymboree! I'm slightly addicted too, that's all. Ya know, you might not believe this but I've NEVER purchased even one single thing from Gymboree. I've been in the store 200 times and I love everything I see but I just can't bring myself to fork over that kind of cash. And I've never been lucky enough to get Gym Bucks or coupons in my (e)mail. No, please don't tell me how to rectify that! I have no will power so it's better that I never figure out how to get a deal at Gymboree. If I do, we'll go broke 'saving' all that money! SO know what you mean. Complete addict here! Go check out gymbofriends dot com if you want to go deeper on the dark side. I've been a regular there for a few years- I blame it on my need to know all the lines so I can make M2M bows for my bow business. There is a huge demand for matching gymbo bows. And FYI… the sale went live online the past two years at just after 11pm WED night (It's supposed to be 12:01 Thanksgiving). 30% off everything and a 20% coupn will stack and it's even off the deals- puffer coats will be $20 ($11.20 sale/coupon) and fleece $12 a piece ($6.72 after sale and coupon)- and you earn Gymbucks. My shopping cart has been loaded for a week already! Hi, My name is Kelly, and I am a Gymbo addict/enabler. 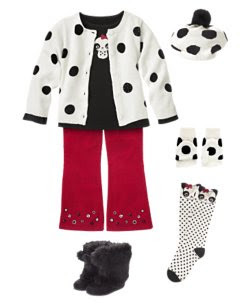 We have the Panda outfits,too. "Hi, my name is Mandi and I am addicted to Gymboree." Seriously, I think they need to have a 12 step program for all of us moms who are addicted to Gymboree. I was just in there tonight and got 2 sweaters and a pair of cords for $12.00 each and a set of hat and gloves for $4.50 each. How can you NOT be addicted when their prices are this good right now. Haha!! Right there with ya!! I dressed Breanna and Dawson in Gymbo for as long as I could…but considering they are now 14 and 11…well, it's been awhile. UNTIL our match!! OUTCH!!! I need to join that support group, too! Khloe is already loaded with some cute stuff from there…hopefully I got her sizes right. I just spent a pretty penny last week…included in the bag is some fo that cute Panda line! LOVE their clothing!!! I'm with Donna. I can count on one hand the items I've bought there. I don't pay more than $5 for one item of clothing so even their sales don't usually fit my budget. I do however LOVE their clothes; I just find them used or have them given to me! :))) Not a bad deal either!!! The clothes are really cute! Hopefully AA won't understand about brand names for a long time!